Download in a flash, with FlashGot! Noscript 2.0, here we come! BTW: http://noscript.net/forum needs to be updated. [NoScript XSS] Sanitized suspicious request. Original URL [https://www.meebo.com/getfile.html?filetype=text%2Fplain%3B+charset%3Dus-ascii&filename=test.test+%28test%29.txt&filesize=4&domain=www.meebo.com&fileid=0827095075] requested from [http://ec2-67-202-14-4.z-1.compute-1.amazonaws.com/scripts/upload_file_ft.py]. Sanitized URL: [https://www.meebo.com/getfile.html?filetype=text/plain%3B+charset%20us-ascii&fileNAME=test.test+%20test%20.txt&filesize=4&domain=www.meebo.com&fileid=0827095075#14182912952982774857]. The warning (message bar) is just shown for a second, I guess it disappears because the iframe is reloaded. Last edited by dhouwn on January 31st, 2009, 9:32 am, edited 1 time in total. thanks for the pointer about the forum. That file name is no good. Please remove those round brackets. RefreshBlocker for Firefox 3 has finally been released. In Firefox 2, both Giorgio and I recommended the RefreshBlocker extension for controlling automatic page reloads caused by the refresh parameter of the META tag element. Unfortunately, the internal changes in Firefox 3 prevented this extension from working. The developer released a version which works in Firefox 3 on Jan 3. I've been using it again for over three weeks, and it seems to works as well as it did in Firefox 2.
re: ClearClick warning from this post, viewtopic.php?p=5629455#p5629455. could you tell me the page of the ClearClick thing? On the second, I received the ClearClick warning. I was using the "new uploader" as opposed to the "bulk" or "old" version. If I recall correctly, the warning appeared after the file had already uploaded & as/after the photobucket "Add titles, descriptions and tags to images below" page was/had loaded. Might there not be something that is causing 1.9 to show (partially) broken https: sessions? 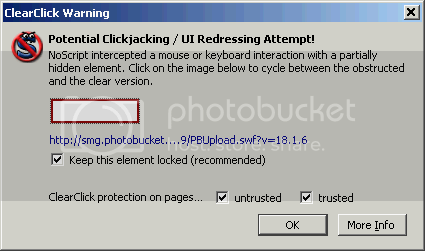 The ClearClick photobucket thing: I can't reproduce it, but did you say it's been just one shot? Maybe it's been a race condition where the image was not loaded yet in one screenshot and was there in the other. Regarding the HTTPS issue, I strongly doubt it's something NoScript related, but could you tell me where you can see it happening? 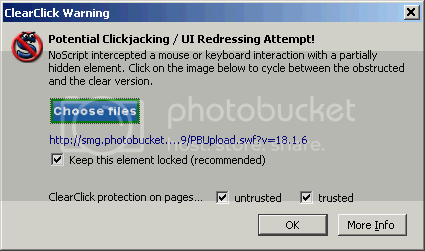 Yes, the ClearClick photobucket happened only the one time. And yes, the broken https: warnings look to be a Gecko > 1.9.1 issue - not related to NoScript. It happens both in SeaMonkey 1.9.1 & FF 1.9.2. Is ClearClick always alerting when CSS transforms are used? not always, but it's very likely (especially on chromatic transformation). However it happens only on cross-site transforms (obviously). Note that it does not skew in Gecko < 1.9.0. The XSS protection is very annoying whenever I try to use evernote add-on. And apprently i can't make it an exception simply by adding it to whitelisted sites. It doesn't work when i also whitelist the site i'm trying to take a clip from either. I think you should either put an option like "disable xss for whitelisted sites" or make it easier to make exceptions for XSS. Cause I have no idea what those regular expressions are and I won't learn them just to make no-script work. By the way, can you show me how to add http://www.evernote.com/clip.action to XSS exception list for the time being? are you sure you're using latest NoScript version? It's since 1.8.9.6 (5 builds and 2 stable versions ago) that we've got specific code to work around the Evernote's troubles (which however should have been fixed by Evernote: Google Notebook doesn't require any work around to work with NoScript).